Like it? 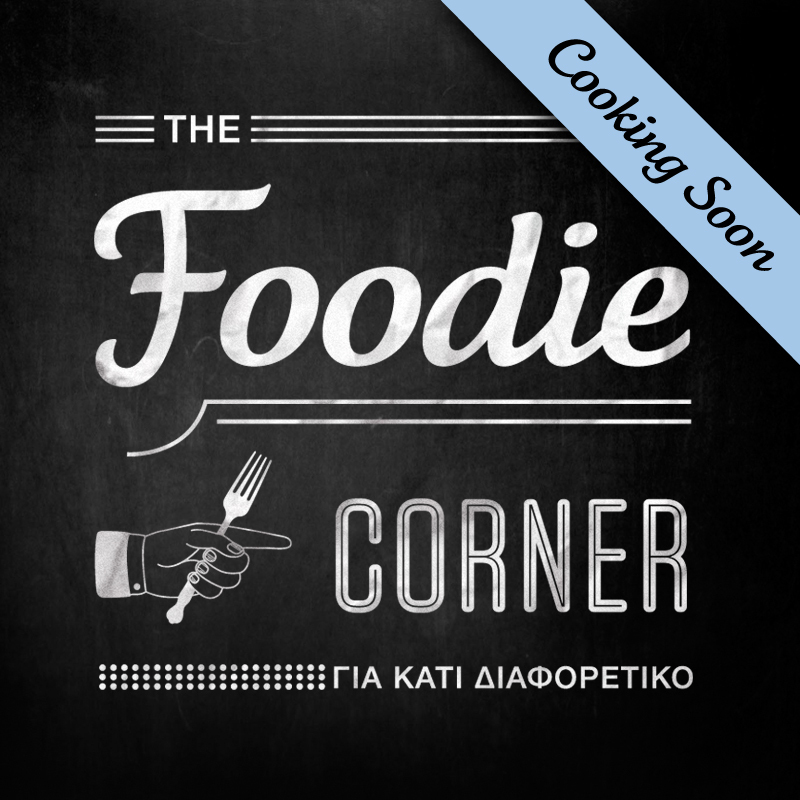 The Foodie Corner is soon to become a reality. From wire frames and sample pages to a real live blog. Just a few weeks (or even days) away now! 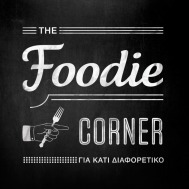 I know most of you won’t be able to follow me there as it’s going to be in Greek (unless you’ve been taking lessons?) but I really wanted to share this image here so you guys have a small sneak preview of what is to come. I have no intention of dropping On Top Of Spaghetti, and after the first few months of ups and downs I aim to be back blogging here as often as possible. In the meantime, what do you think? Cool isn’t it? I have been working with a fabulous team of designers and developers, whom I will introduce in a later post (when you have more than just the one image to see!). They have done such a great job. So I’m adding this little gem of a picture to my side bar! At first I thought I would just post this without a recipe. But you know me. Can’t write anything on here without sharing something delicious. And today I have an extra special treat; a Dukan dessert. I’m not on this diet anymore, but once in a while I will have a Pure Protein day (or two) because it makes me feel better. Just to remind you, the diet is based on protein and vegetables, cutting out fat and carbs. I know the human body needs fat and carbs, but this human also needs to fit into certain jeans. So a little Dukan Attack here and there won’t kill me. Also, I enjoy thinking up recipes that will help those who are on the diet. Like this one! 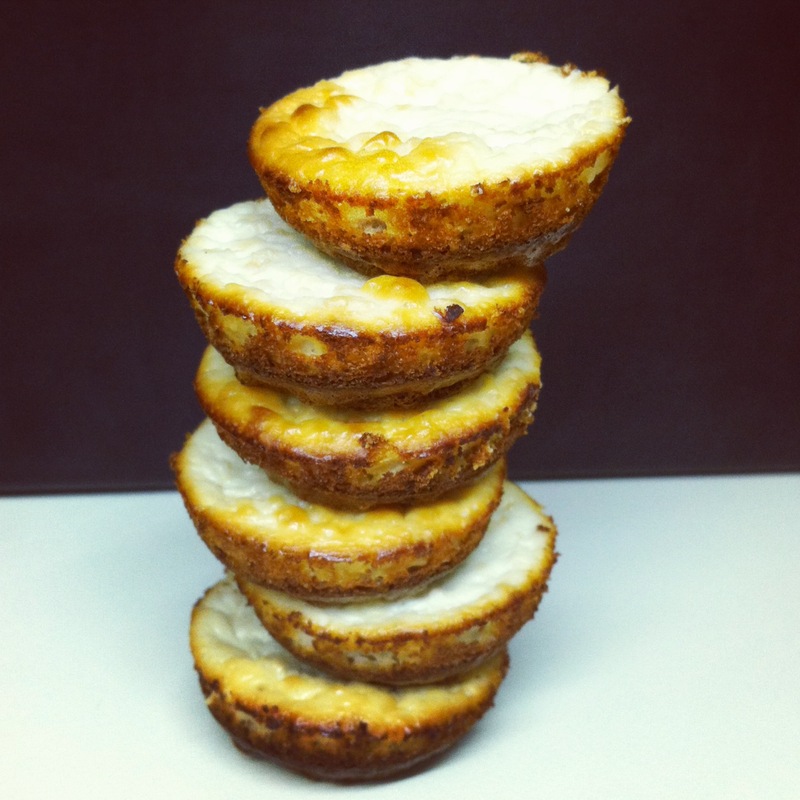 These mini Dukan lemon cheesecakes are based on two recipes. The first is for Dukan cookies, which I thought could be my base if made in mini form (digestives and graham crackers are sadly not allowed!). The second is a lightened up version of lemon and blueberry cheesecake using lemon flavoured yogurt, on the blog “Whatever Gets You Through The Day”. Iris took part in a challenge and used a lemony yogurt to create this lovely looking dessert. It’s pretty light as it is but not quite suitable for the Dukan Diet, so I got to thinking of ways to adapt it. There is a dairy company here in Greece called Mevgal, which produces this amazing 1% lemon yogurt. It’s like no other I’ve ever tried. (And I’m not getting paid or compensated in any way for saying that! I just love it.) For a while now I’ve been thinking of making some sort of cheesecake with it, and this seemed like the perfect opportunity. So, with a bit of mixing and matching, I came up with these babies! I still can’t believe how close they are to real cheesecake! Ok, the base is not like a biscuit base, it’s much softer and -let’s be honest- not as tasty, but it does provide a nice contrast to the lemony filling. When I offered one to The Mister he didn’t believe they were Dukan approved, he was worried that at 23:50 I had finally given in and spoiled the Pure Protein day. Now that was a good sign. I had quite a bit of leftover filling because my mini muffin pan is very mini. So I just poured it into ramekins and baked it alongside the little guys, without a base. This too was very nice, I’ve just finished one now. Just sweet enough and very cheesecakey! This morning I had one with a teaspoon of raspberry jam on. Mmm! But that’s only for non-Dukaners. Right, I’ve gone on about this too much. Here is the recipe! 2. For the base: Mix all the ingredients in a bowl. Pour mixture into a non-stick 12-hole mini muffin tin (a regular muffin tin would work too, you’d probably get 6 or 8). You only want a little bit of mixture in the bottom of each mould, remember this is the base. Pour any leftover mixture into individual muffin moulds, you can make more cheesecakes or leave them plain – they would be lovely with scrambled egg! 3. Bake for 10-15 minutes till lightly browned (see note at end). 4. In the meantime mix all the filling ingredients together (you can use the same bowl for less washing up! yay!). 5. Take the muffin tin out of the oven and pour filling over each little oat bran base. Fill to the top, these will rise a little then fall back down. Pour any leftover mixture into some ramekins or over the stray muffins from above. Pop them back in the oven for about 20-25 minutes till set and lightly browned (see note). 6. Take out of the oven. You will be excited at how nice and fluffy and risen these will look while baking; be prepared to see them sink back down! But that’s ok because they taste good. Note: I think with these times mine turned out a little overbaked as they were sliiiightly dry. This might just be due to the ingredients, especially the oat bran, but I think it was the time in the oven. Iris made a whole cheesecake and baked hers for 25 minutes so I think my tiny muffins really didn’t need that long! I liked the fact that they were browning (goodness knows why) and left them, but next time I will check at 15′ by touching the surface. If it’s set I’ll take them out. Don’t forget the base has already been cooking quite a while. Also noteworthy is the fact that these are much better the day after! Sounding all the more like proper cheesecake! Last Saturday it was The Mister’s birthday, so I decided to throw him a surprise party. I had been thinking of doing this for a while now, but I just couldn’t believe I could pull it off. But I did! Boy was it hard work, and nerve wracking and complicated. But so worth it. He was truly gobsmacked! As you can imagine, I went a bit overboard with the food. I started preparations on the Wednesday, with the first step being the menu, the shopping list and the schedule. Yes, like the one I mentioned in my post on preparing ahead. Thursday morning was supermarket time, and from then on I spent a significant amount of time in the kitchen, cooking up all sorts of goodies. I was expecting about 20 people, so a buffet style dinner was the best option. For a peek at the menu take a look at the bottom of the post. It might seem a strange assortment of dishes, but I wanted to include some of The Mister’s favourites as well as some slightly more adventurous recipes. 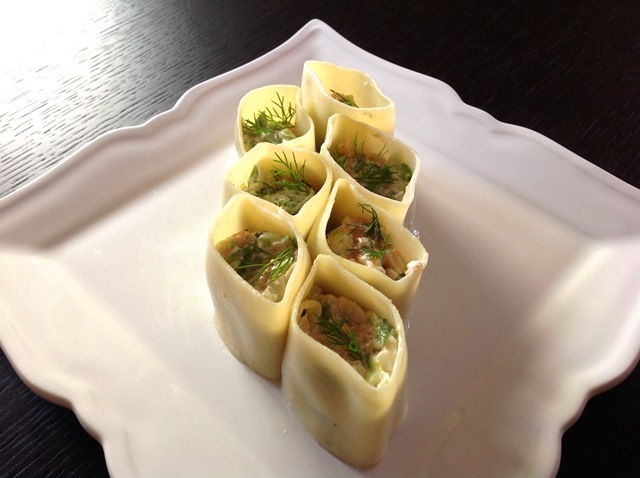 One of which is the dish featured in this post, Smoked Salmon, Raw Courgette (Zucchini) and Spearmint Cannelloni Bites. You are probably wondering what I did for a birthday cake. Well, you will be surprised or maybe even shocked to hear that I let go of that part and allowed The Mister to blow out candles on a store bought cake. Was it a terrible thing to do? Well, time-wise it would have been a struggle to make it myself (it might have even ruined the surprise as he decided to come home early on the day of the party – yeah, I have a couple more gray hairs thanks to that – and he would have more than likely found me icing it). Plus, Greek store bought birthday cakes are delicious (they are patisserie style, creamy affairs with whatever decoration you can imagine – in this case The Mister’s football team emblem). And sometimes, you just have to accept that you can’t do everything. So I’m glad and grateful to The Mister’s sister for taking care of it! Moving on to our recipe. A couple of weeks ago I saw that this month’s “Swallow’s Recipes for Life” challenge on Bangers & Mash is a recipe using salmon, courgette (zucchini) and pasta. I knew I wanted to participate, as these are favourite ingredients of mine. I had recently made a gorgeous pasta salad with raw zucchini (recipe by Elena’s Cooking) and thought I could use that as a base. It’s so summery and fresh tasting. I did however, want to make it a bit different to your average pasta salad. The original idea was to make a filling and stuff large pasta shells with it; that didn’t work out though as this particular type of pasta seems to have vanished from supermarket shelves in Athens. The only other alternative I could think of was cannelloni tubes. I wanted something that could be eaten as finger food, so it had to be large enough to accommodate a bite size portion of filling. This was the result. It was impressive and pretty, but also a little faffy! So you will find two versions here, one for the bites as shown in the picture and one for a regular pasta salad. 1. Coarsely grate courgettes and place in a colander over a bowl. Sprinkle lightly with salt, shake/flip in the colander and sprinkle again. Set aside for at least 30 minutes so liquid is released. 2. If you are making the pasta salad, boil your pasta according to package instructions. Drain and return to the pan (off the heat) with a bit of olive oil so the shapes don’t stick together. Shake it all up once in a while. For the cannelloni bites boil the tubes till tender but be careful not to overcook. After about 10 minutes taste one to be sure. When ready drain them and return to the pan with olive oil. 3. Put salmon chunks in a big bowl. 4. In a smaller bowl mix yogurt, mayonnaise, feta, spearmint, olive oil, lemon zest and juice, pepper and pine nuts if using. Mix well with a fork, breaking up any feta lumps. Taste and adjust to your liking. Add to the salmon but don’t mix yet. 5. After about 15 minutes you will see that the courgettes have started to “sweat”. When the half hour is up, help them along by squeezing a bit with your hands being careful not to mush them. Add to the bowl with the salmon and yogurt mix. 6. For the pasta salad, add the pasta to the bowl and toss well but carefully. Let it cool completely and refrigerate till a couple of hours before serving. 7. 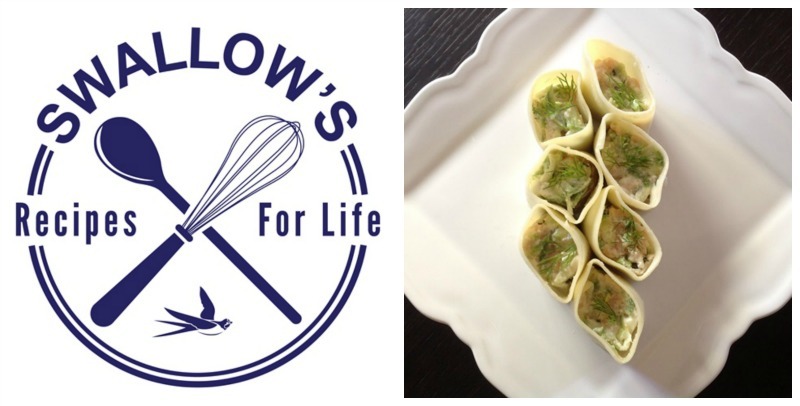 If you are making the cannelloni bites, toss the courgette, salmon and yogurt mixture carefully. Place the bowl with the filling and the pan with the cannelloni near you. Bring out the serving dish and place that near you as well. Take a tube, cut it into three smaller tubes, and peel the first one open with your fingers. (Make sure they have cooled enough, but don’t let them get completely cold as they will stick.) Fill the little tube with a teaspoon or two of filling (place your fingers at the bottom to keep the filling in) and quickly stand it in the serving dish, open sides up and down. Be gentle and fairly quick so the filling doesn’t plop out of the bottom while being transferred. Keep going till your filling is finished. I garnished with tiny bits of dill weed, but they are just as pretty without. Refrigerate till a couple of hours before serving. – I used between 10 and 15 cannelloni tubes. Unfortunately it is necessary to boil more than you will use so that you can allow for some to split during boiling or filling. I kept the rest, filled with leftover meat sauce from the lasagna, put them on a layer of tomato passata in a baking tin and froze the whole thing. I am hoping that I can pop that in the oven with some béchamel on top and get a good result. I will let you know! – If you can find the large pasta shells they might be easier and prettier to use. – There are a lot of different tastes in this dish so you could definitely omit the pine nuts without compromising the result. – For a more conventional flavour you could substitute the spearmint with dill weed. But the spearmint is so summery and fresh; I think it makes this dish special. For a while now I’ve been meaning to try and adapt this classic Greek recipe for preparation in the slow cooker. It’s one of those things I usually remember at the wrong time, like when I haven’t defrosted the minced meat. Finally, on Saturday I remembered to take the meat out of the freezer, buy parsley, and properly plan my experiment for Sunday. This had to be a weekend endeavour for me, as I knew the meatballs wouldn’t need all day in the slow cooker, and my working hours have me away from home for at least 9.5 hours on weekdays. 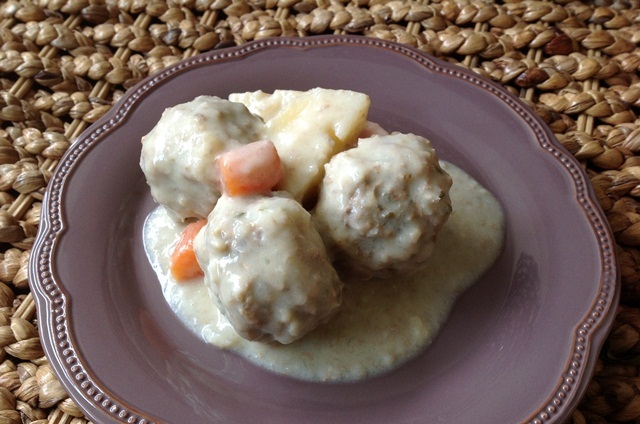 Giouvarlakia are meatballs made with rice in the mixture, cooked in water or stock and served (traditionally) in egg-lemon soup (Avgolemono). If you don’t fancy soup, this version makes the juice just thick enough to act as a sauce (albeit a runny one), ideal for being mopped up with fresh crusty bread. Chips (French fries) are also good vessels to use for plate cleaning in this case. The resulting meatballs are similar to the insides of these stuffed courgettes, but are much easier to make. I started by prepping the veg, cutting it into fairly small pieces to cook quicker, and getting it going in the Crockpot. I then made my Giouvarlakia, slightly on the large side so as to delay cooking time a bit and allow enough time for the potatoes and carrots to soften. They were bigger than golf ball size, with about 3-4 level tablespoons of mixture in each one. The amounts stated below gave me nine meatballs. I used a 4 quart Crockpot and the meat, perched on top of the veg, was partially submerged in the 3 cups of water. 1. Place potatoes, carrots and celery in the bottom of the slow cooker insert and pour in the water. If you want to help things along and maybe shorten cooking time, you can use boiling water. I used 2 cups cold, 1 cup boiling. Sprinkle one teaspoon of salt over veg and water. Turn on slow cooker to low. 2. In a large mixing bowl, combine the meat, onion, parsley, rice, 1 teaspoon salt, pepper and oil. Mix well with your hands till it comes together, but don’t over mix so the meatballs aren’t too dense. 3. Shape the mixture into meatballs and place on top of the veg in the slow cooker. Some won’t be completely submerged, that’s fine. 4. Leave them to cook for about 6 hours and check for doneness. You can use a thermometer or break one in two and take a peek. I find that the thermometer is best, as sometimes meat in the slow cooker keeps a sort of pinky colour, even if it’s well over the required temperature. Mine were in for 6 ½ hours on low and were done, as was the veg. During cooking (after about 3 hours) I also turned them upside down once, using barbeque tongs, but I’m sure they would have been fine even if I hadn’t disturbed them at all. 5. When the meatballs are ready take them out of the slow cooker with a slotted spoon (keep them warm as best you can, but don’t worry too much). In a mixing bowl beat the eggs and lemon juice till well combined. Place the bowl next to the slow cooker, and using a ladle, slowly add small amounts of hot juice into the egg mixture, beating continuously. Start with about one tablespoon at a time, and gradually increase the amount of juice added to the bowl. This is called tempering the eggs and it needs to be done so they don’t scramble. When most of the juice from the Crockpot has been transferred to the egg mixture, and the bowl feels warm to the touch, pour the mixture back into the insert. Take the insert out of the base and move it round a bit, so the sauce goes all round the veg, and place it back into the slow cooker. 6. Put the meatballs back into the sauce (or soup! ), cover and leave for about 5 minutes till it’s all warmed through again. Keep an eye on it so the egg doesn’t misbehave! 7. Serve with fresh crusty bread and feta cheese. Note: If you want to enjoy this as a soup, I suggest you use 4 cups of stock instead of the 3 cups of water. Wow, two posts in two days! I’m proud of myself. For a while now, and especially during the Dukan Diet I was on during the summer, I’ve been conscious that I don’t eat enough fish. The Mediterranean diet calls for fish twice a week and I really want to start keeping up with that. Fish is a fantastic food. It’s full of protein and any fat it has is the good kind, it’s quick to cook and it’s tasty. The only down side is that is a bit costly, but it’s worth every penny when you consider the benefits. At some point I will start experimenting with the more demanding types of fish, the ones that still have heads and tails and backbones even after arriving in one’s kitchen. Here in Greece it would be inconceivable to serve fish without the head, unless of course you’re having a fillet or “slice” as it’s called, of a large one such as swordfish. For many people (I’m not one of them) the head is the tastiest part and they’ll take their time dismantling it to get to the little bits of meat and juice inside. For now, I stick to cooking filleted fish and enjoy the whole ones when they’re cooked by someone else (and in someone else’s kitchen). Check the eyes; they should be shiny and bulging (never buy a fish that’s had its eyes removed – some fishmongers do that so you can’t tell whether it’s fresh – which means it’s not!). The gills should be deep red or pink, and moist not dry. If they are brown and dull move on. The skin should be shiny and should spring back when pressed with a finger without leaving a mark. The body should be firm and slightly arched and should stay like that when held on an open palm (head and tail pointing upwards). However, the ice the fish lies on helps keep it firm, and apparently some clever fishmongers put salt on the ice which helps with firmness even more. Fresh fish doesn’t smell at all. Don’t expect to smell the sea, if you do, it’s about a day old. If it smells fishy it’s about 2-3 days old. The scales should be shiny and should come off easily without the skin becoming damaged. The insides should also come out easily and in one piece. If things disintegrate during cleaning you should be wary. When grilled, fresh fish “opens” and comes off the bone. The bones should be white (except for garfish which has a green backbone) not dark. 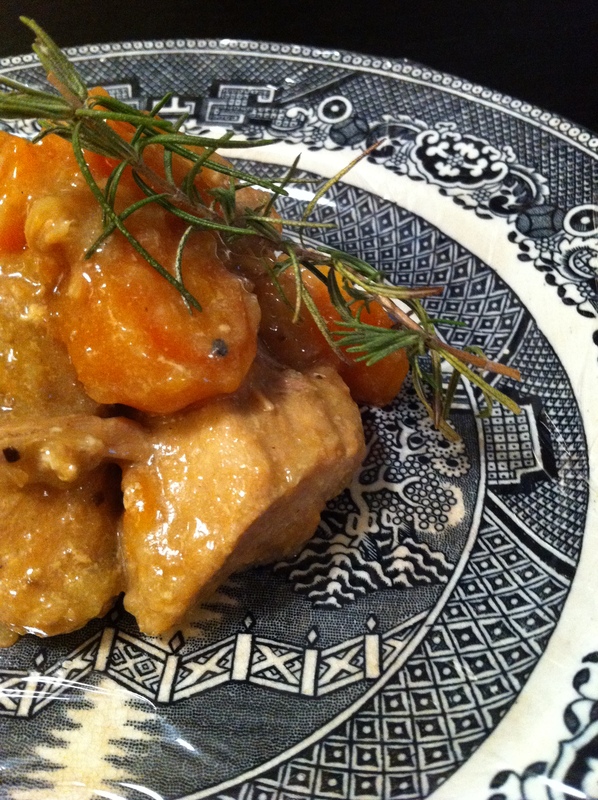 I found this recipe on the website of a major frozen fish company in Greece called Kallimanis. It’s very lemony, but that’s more than ok with me. I didn’t use wine because I didn’t want to open a bottle for ½ a cup, so I used a little bit of white wine vinegar instead. It made the sauce really tangy and yummy. If your palates are sensitive use a little less vinegar and lemon juice. Rinse the fish and pat dry with kitchen paper. Sprinkle with salt and freshly ground pepper. Combine the rest of the ingredients in a jar with a tight fitting lid. Shake to mix well. 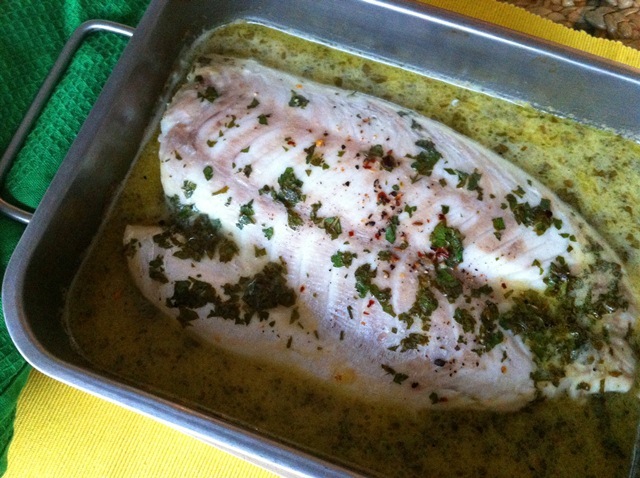 Place the fillet in a smallish, lightly greased baking tin. Don’t use a big one so that the fish is at least partly submerged in the sauce. Pour the contents of the jar over the fish. Bake at 200C for 15 to 20 minutes depending on the thickness of the fillet. Notes: You’ll get quite a bit of sauce but it will be runny. You could thicken it if you want and pour it over the fish when served. I’d transfer the sauce to a small pan, heat it to boiling point, take it off the heat, add a slurry of 1 tsp corn flour/3 tsp water, mix well and return to the heat for a few minutes till it thickens. Now that I’m thinking about it a teaspoon of capers might work quite well in the sauce. You can of course use any firm white fish you like. To make it Dukan Diet friendly omit the olive oil. It seems I’ve fallen into a nice little routine of posting a new blog post every Sunday. However, this week I’m getting in an extra one(um, I was supposed to have this uploaded on Thursday. Saturday instead of Sunday isn’t quite breaking the routine!). Anyway. The past week has actually been a bit of a food blogger’s nightmare. First came a recipe I hoped would rock, but it turned out mediocre (will try it again before posting). This was Monday. Two days later I had a minor disaster when I forgot to turn on the slow cooker before leaving for work in the morning, and a whole turkey breast sat waiting for me all day to get home and cook it some other way (thank goodness it’s still cold these days, otherwise it would have ended up in the bin and that would have been a crime). In the end I tried two different ways, since there was a lot of meat to use up. One of these ways was a turkey korma, with a ready-made sauce (*gasp*). Sometimes shop-bought is just the best option. We’re only human. The other way however, well, that was absolutely gorgeous! But the third and most annoying disaster of the week was that I forgot to take photos of it. So I’ll just have to make it again before telling you all about it. Soon, very soon. Finally, and having remembered to both plug in the slow cooker and turn it on this morning last Thursday, I have a dish to talk about, complete with photo (antique plate an’ all – thanks Collector!). I’ve been wanting lately to try out a few traditional Greek recipes adapted for the slow cooker. Greek cuisine has many stew type dishes, which are called “of the saucepan” (katsarolas) because they are –surprise- cooked in a saucepan on the stove top. These are all good candidates and I’m slowly working my way through some of them, so I can share them with you here. This dish is called Lemonato, which means “lemony”. It’s basically meat, cooked in stock and lemon juice with a few herbs and is usually made with pork, beef, chicken or rabbit (yeah, sorry about that). Mine is pork. Lemonato is mostly served with french fries or rice, or potatoes that are cooked in the pan with the meat and sauce (we had it with mashed potatoes, which is probably unheard of here!). It’s lovely with any of these, but to eat it like a true Greek, you need to also have some crusty bread on hand to scoop up the wonderful lemony sauce. So, here goes. About half an hour before the end of cooking time check your sauce. If it’s too watery for your liking, use a cup to take some of the liquid out of the slow cooker (you want about ¾ of a cup). Mix in the corn flour, and stir well until it has completely dissolved. Then pour it all back in and cook for a further 30 minutes on high. Due to this being a work day, mine was on for about 9 ½ hours. 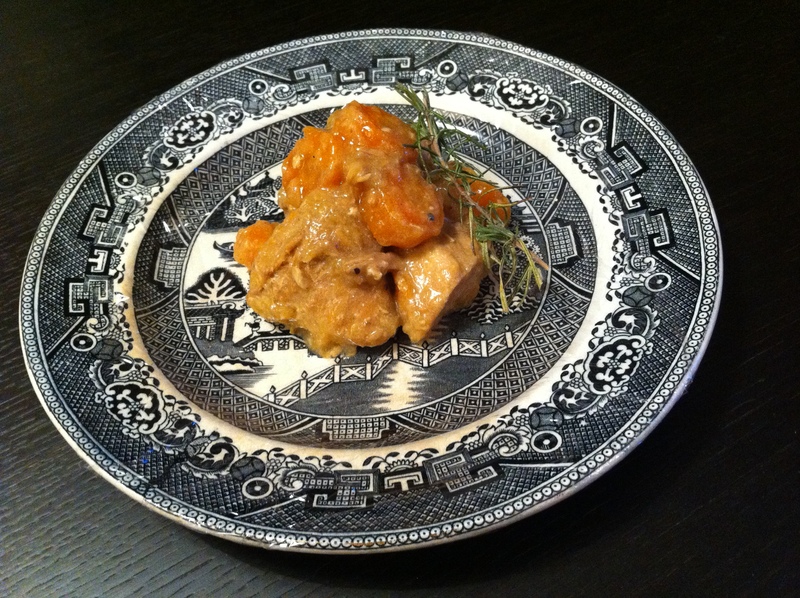 I think there is a point after which meat becomes a bit tough again in the slow cooker. I’m not sure about this, so I’m going to experiment, but it’s happened a couple of times with some of the recipes I’ve tried, including this one. If you have any idea whether this is the case, please let me know! This was a really nice dinner, and made even nicer leftovers, but next time I would start checking for doneness after about 7 hours (providing I’m not stuck in my office). I might also omit the rosemary (it was a teeny bit strong for my taste) or maybe replace it with some dried oregano (½ tsp at the most).